I love secret menus! Some of my favorite foods are only found on secret menus: Animal-Style French Fries (In-N-Out), Red Gummy Bear Smoothie (Jamba Juice), and Zebra Hot Chocolate (Starbucks). 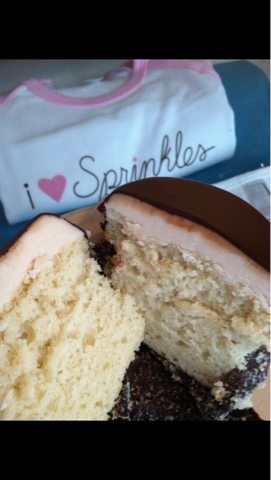 Did you know Sprinkles Cupcakes has a secret menu? It just launched yesterday and has just one cupcake on it....for now. I snapped some photos of their Facebook post announcing it because, true to their word, the post disappeared 48 hours later. 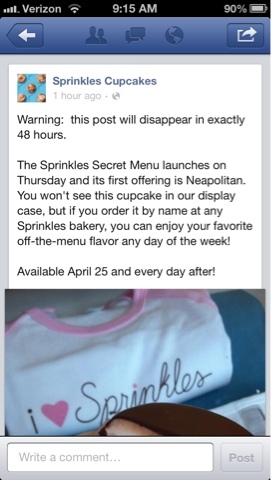 The first flavor to debut on the Sprinkles secret menu is Neapolitan. It doesn't have a description, but it looks like a vanilla cupcake with strawberry frosting and dipped in chocolate ganache. I want this! Neapolitan is available starting today, but you have to ask for it by name, as it won't be on the menu. Can't wait to try it and see what's next on the secret menu!